Breakers Topinabee review, pics, hours, and menu info. 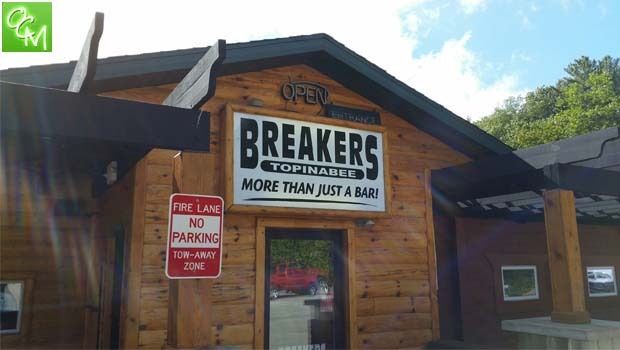 Breakers bar on Mullett Lake is located north of Indian River on N Straits Hwy in Topinabee. Breakers Bar and Grill is just about everything you want in an “Up North” bar and restaurant… great food, comfortable setting, and an awesome view of Mullett Lake from either inside the restaurant, or on the patio or rooftop deck! Breakers in Topinabee is owned by one of our own… a former resident of Shelby Twp MI. Derek (the current owner of Breakers), is a ’92 graduate of Stevenson High School and a former Shelby Twp resident. He purchased Breakers in 2005 after working in various local restaurants like Shelby’s Mr B’s, The Shamrock Pub in Downtown Utica, etc. After Breakers was bought out, it was given a face lift and changed up a bit. Breakers offers an outdoor patio, rooftop patio, pool tables and dome hockey games inside. There are some great wall hangings as you’d find for the typical bar decor, but way more interesting and with some great history behind some of it. It’s an Up North “dive bar” that was given an incredible makeover – think of it as an Up North version of a Mr. B’s or G’s in Lake Orion. Breakers Topinbee sets itself apart from other Up North bars by going the extra mile to offer live entertainment during peak season, arcade machines, bubble hockey, and more. Breakers does a great job catering to families as well as the up north “party” crowd. The food at Breakers Bar and Grill is impressively good. We ordered some plates that Breakers tends to be famous for – burgers and ribs. Both were tasty. I highly suggest that you opt for the seasoned fries which were quite good as well. The rest of the Breakers Bar and Grill menu offers up appetizers such as Buffalo wings and beer battered O-rings, salads, soups, sandwiches such as the Codwhich and a Chicken Philly Wrap, platters such as Hand Battered Cod and a Coney Dog Platter, and burgers such as a Bourbon Bleu Burger and a build your own option. See related posts below or our Reviews / Travel tab for more great reviews from the Indian River, Petoskey, and Harbor Springs, Michigan area.